Earlier this month, I had the opportunity to go on one of every Salmon Fisherman’s “Bucket List” trips, to fish British Columbia’s Queen Charlotte Islands. I joined the Salmon University excursion to fish on the Oak Bay Marine Group’s MV Charlotte Princess, which is anchored in a sheltered cove off Langara Island. The trip to ship, the accommodations, the food and service were all amazing but I am going to skip that for now and jump right to the fishing. To me, our best day was our Sunday morning. At 5:00 am, we left the “mother ship” and I drove our “Fat Cat” fishing boat 30 minutes to the prime fishing waters off Andrews Point. My partner for the trip was my friend Terry Wiest. It was our last day to fish and we saved three of our eight quota of Kings for this morning. However, we only had four hours before we had to get back to the ship as we were flying out later in the morning. That short time period turned out not to be a problem as the fishing was outstanding that morning. To say the King fishing was Red Hot that morning is an understatement! While Kings were not actually jumping in the boat, I did net one of Terry’s Kings as it rebounded off the side of the boat! We were hooking multiple kings on every drift. However, these are extremely feisty fish and we were losing many of them. We were motor mooching herring and here is what a typical encounter with one of these Kings was like. We would get a bite, set the hook and in many cases reel the King in somewhat close to the boat. I think this is due to Langara’s remote location. These fish had never been hooked before and did not react until they saw the boat, then it was “game on”! I had brought my TICA SEASPIRIT line counter reels with me and I watched these fish rip off 150 -200 feet of line on the initial run! Another advantage about being at Langara is due to its remote location, there were usually no other boats in the immediate vicinity, so it was great to just be able to let fish run and enjoy the fight! Not at all like fishing in crowded Puget Sound! The Kings that we were able to land typically made 7 to 12 runs like this before we were able to subdue them. These fish were definitely in control for most of the fight! We landed our last King with 10 minutes to spare and then headed back to the “mother ship” to start our trip home. 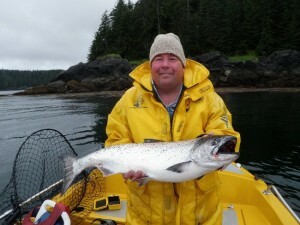 It is still early in the season at Langara and the Kings we kept averaged around 15 pounds. I would truly love to be there when 30 and 40 pound Kings arrive! I can easily imagine the fights with these monsters lasting over an hour! So now that you know something about the Salmon fishing, let us turn back the clock and talk about other aspects of the trip. On the previous Wednesday, I made the 3-hour drive to Richmond, BC and checked into the Sheraton. Once there, I met Paul and Andy, some of the other members of the Salmon University contingent. We had dinner and got to know each other better. We turned in early to be well rested for the early morning flight the next day. We met more of our fellow anglers in the hotel lobby and took the shuttle to the south terminal of Vancouver International Airport. The folks at Oak Bay have their own counter there. As it is a charter flight, there were none of the security hassles that one experiences when flying commercial in the States. The flight to Masset, BC was about two hours. A few people slept but most were like me, too excited to even consider sleeping. We used the time to get to know each other better and talked about our fishing expectations! On arrival at Masset, we shifted to Jet Helicopters for a short ride with spectacular views to the MV Charlotte Princess (AKA “the Mother Ship”). Another advantage of the helicopter ride is that we were also afforded an excellent overview of the SW side of Langara Island. This is the area where we would be fishing much of the time. 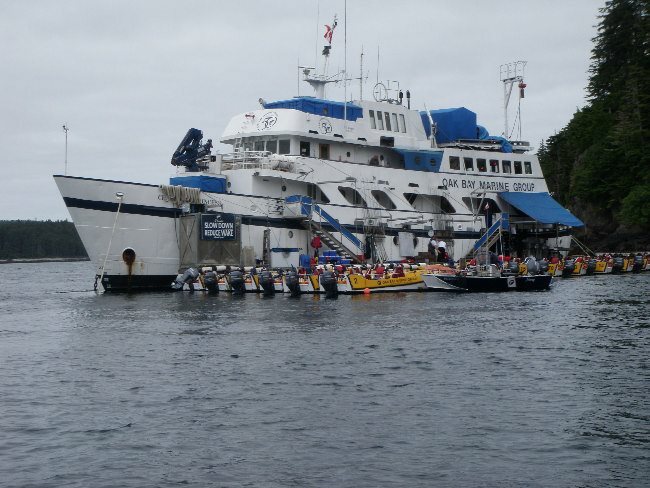 Once on “the Mother Ship”, they fed us a light lunch, gave us an orientation and got us out fishing. You and your partner fish out of 17 foot “Fat Cat” boats. The boats are easy to operate, very stable and are fully equipped for mooching and bottom fishing. There are salmon and bottom rods and reels, a tackle box with hand-tied leaders and assorted gear, and most importantly a cooler over-flowing with prime brined herring. The trip is described as “self-guided”. However, there is an excellent “Fishmaster” who is constantly on the water showing you where to fish and telling you how deep to fish a specific area. For Salmon fishing, the most important pieces of information are the “number of pulls” of line you have out and the water depth to be in. Terry and I brought a lot of own gear with us but in the end the only things I caught Salmon on were 6 foot mooching leaders tied with two 5/0 hooks, TICA SEASPIRIT line counter reels and 10’6” TICA rods. The line counter reels made fishing much easier because you did have to count “pulls” and the long rods were necessary to control these feisty fish. The long rods also made it easier to land the salmon with the long leaders. We exclusively used plug cut herring with a six or eight ounce mooching sinker. We put our offerings out the prescribed distance and “kicked” the boat in and out of gear while we waited for the bite. We were fishing three rods and our best depths were 50, 80 and 110 feet. And most days there were lots of bites! While fighting one fish and drifting, it was very common to get a bite on another rod. As we were fishing with plug-cut herring and using barbless hooks, it was important to get on that rod ASAP because if the salmon striped the bait, it was gone! I cannot tell you the number of double and triple headers we had but they were a routine occurrence. I also have to tell you that there were some slow times as well. The first afternoon, I only had one King on but it was in the 20-pound range. Unfortunately, a sea lion was able to inhale the fish while it was on the surface and that was all she wrote! 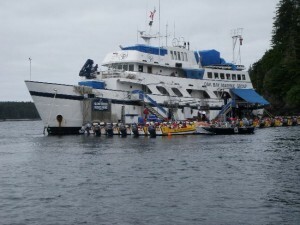 During the trip, we were also greatly hampered by moderate winds that kept the west side of Langara Island closed for the entire trip. 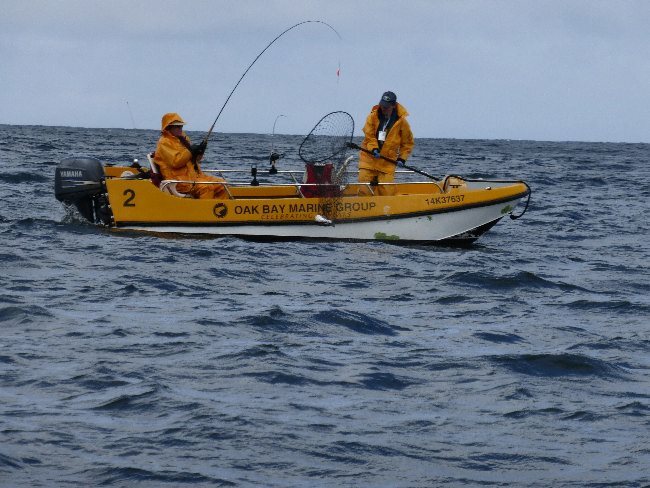 I am told this is very unusual and it was unfortunate as it denied us access to some of the prime halibut and ling cod areas as well as a number of good salmon areas. 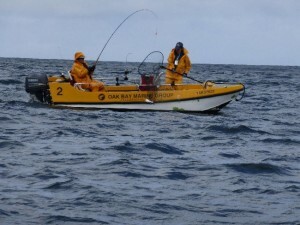 However, the “Fishmaster” was constantly on the water and monitoring the weather conditions. On Saturday afternoon, when the wind conditions abated, he “opened” the north end of the Island. 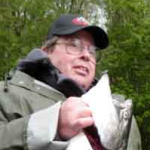 He then led all the boats that were interested to an excellent bottom fish spot, that very quickly produced limits of very large rock fish and a number of chicken halibut in the 25-pound range. Our other major problem was Pink Salmon. At times, they could be a real menace! You would have a Pink on every rod and you had no choice but to move because you were just getting one pink after another. Terry and I were there to fish and we did not come in for lunch. However, the staff had already packed our choice of items for bag lunches, thermoses of hot beverages and coolers of cold drinks. It was all there when you went down to your boat in the morning and if there was anything else you wanted, all you had to was ask and it was immediately provided. However, I understand from some of the guests that came in for lunch that the meal was excellent and as always, the service was outstanding. Also, whenever you returned from fishing, there was always someone from the “boat staff” on hand to meet you and process your fish. We had a very comfortable room with two beds and private bathroom with a shower. It was so spacious that you only remembered that you were on a ship when you looked in the closet and found the required life jackets. Each evening, there was an “unofficial” social hour that started at 7:00 pm in the upper lounge where the guests began unwinding with an adult beverage or two. A four-course gourmet meal was served at 8:00 pm. You had your choice of several entrees and complementary red and white wine flowed freely! The food was excellent and quantities were more than adequate to fill the hungriest of diners! The “Fishmaster” started the meal by reviewing the fishing highlights for the day and giving the forecast for the next morning. Over dinner, all the guests “relived” their day on the water and told stories of the ones that got away as well as the ones that did not! The evening meal was not mandatory and guests who chose to continue to fish were welcome to do so as long as they checked in by radio. However, the food was so good, that very few people missed the evening meal. But alas our time in this “fishing heaven” went by too quickly and it was time for us to head home. If you are interested in experiencing your own time in this “fishing heaven” contact laurie_mcpherson@obmg.com or 1 (800) 663-7090.